South Jakarta Fire Handling and Rescue (Gulkarmat) Sub-dept. has given fire handling socialization to 68 RWs in South Jakarta.
" Fire handling socialization has been given to 68 RWs in South Jakarta until November 2018"
"Fire handling socialization has been given to 68 RWs in South Jakarta until November 2018," informed Hesti Utami, South Jakarta Gulkarmat Sub-dept. 's Prevention and Public Participation Section Head, Tuesday (11/6). She is targeting to give fire handling socialization to 80 RWs in South Jakarta this year. Socialization is given in various ways, for example is to train residents how to extinguish fire in traditional way by using wet sack and towel. Besides, residents are also trained to extinguish fire using fire extinguisher (APAR). 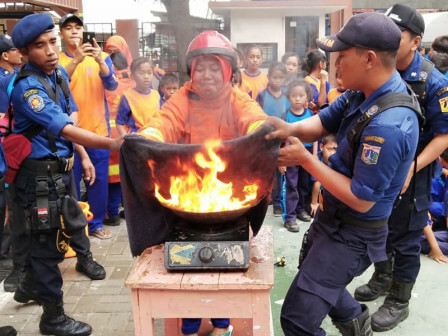 She admitted, it is an important for residents to know how to extinguish fire using equipment at home (traditional) such as wet towel and sack, or using fire extinguisher (APAR). "Hopefully, residents become more understand how to extinguish fire in both traditional and modern way," she conveyed.